Distracted driving is defined as “anything that takes your eyes or mind off the road, or your hands off the steering wheel” and is usually applied specifically to cellphone/smartphone use, including talking on the phone and texting. According to the latest statistics from the Department of Transportation, 3,477 people died as the result of texting or cell phone-related distracted driving in 2015. Additionally, another 391,000 were injured in motor vehicle crashes caused by distracted drivers. Hand-held Cell Phone Use Ban: 15 states, D.C., Puerto Rico, Guam and the U.S. Virgin Islands prohibit all drivers from using hand-held cell phones while driving. Now, let’s take a closer look at the distracted driving laws and regulations from the State of California, as those often set precedent for other states. Using mobile phones while driving is regulated by California Vehicle Code, Division 11: Rules of the Road, Chapter 12: Public Offenses, Article 1: Driving Offenses; Sections 23123 to 23125. 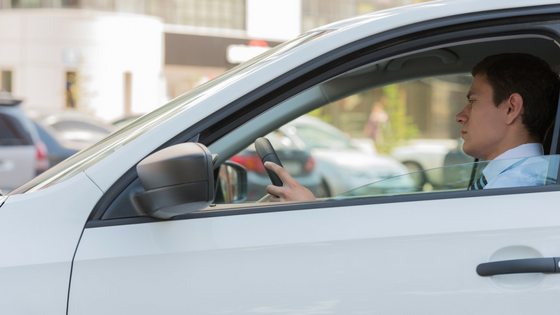 It contains four specific laws and regulations of which California drivers should be aware. The handheld wireless telephone or electronic wireless communications device is mounted on a vehicle’s windshield in the same manner a portable Global Positioning System (GPS) is mounted pursuant to paragraph (12) of subdivision (b) of Section 26708 or is mounted on or affixed to a vehicle’s dashboard or center console in a manner that does not hinder the driver’s view of the road. The driver’s hand is used to activate or deactivate a feature or function of the handheld wireless telephone or wireless communications device with the motion of a single swipe or tap of the driver’s finger. A violation of this section is an infraction punishable by a base fine of twenty dollars ($20) for a first offense and fifty dollars ($50) for each subsequent offense. This section does not apply to an emergency services professional using an electronic wireless communications device while operating an authorized emergency vehicle, as defined in Section 165, in the course and scope of his or her duties. For the purposes of this section, “electronic wireless communications device” includes, but is not limited to, a broadband personal communication device, a specialized mobile radio device, a handheld device or laptop computer with mobile data access, a pager, or a two-way messaging device. This section of California Vehicle Code prohibits the use of communication devices even in hands free mode for drivers under 18. (b) Notwithstanding Sections 23123 and 23123.5, a person described in subdivision (a) shall not drive a motor vehicle while using a wireless telephone or an electronic wireless communications device, even if equipped with a hands-free device. (c) A violation of this section is an infraction punishable by a base fine of twenty dollars ($20) for a first offense and fifty dollars ($50) for each subsequent offense. The following section prohibits use of mobile phones for drivers of school buses or transit vehicles. (a) A person may not drive a school bus or transit vehicle, as defined in subdivision (g) of Section 99247 of the Public Utilities Code, while using a wireless telephone. For their first offense, drivers that violate one of California’s distracted driving laws can expect a ticket for $75. Second offenses carry a $190 price tag. Additionally, breaking these laws is considered a moving violation and will go on your driving record. Under California’s point-based system, this means that you will acquire more points on your license, potentially leading to an increase in insurance rates and/or a suspended or revoked driver’s license. If you’re dealing with a distracted driving violation in California, an online traffic school, such as TrafficSchoolOnline.com, can help clean up your driving record. Find out more here.